Kathmandu –Thamel, the tourist hub of Kathmandu, will have a new addition to its package offering to tourists—a cycle lane. The new addition is believed to boost the inflow of tourists as tourists relish cycling more. The initiative taken by the Kathmandu Metropolitan City responds to the clamour of environmentalists and cyclists for cycle lanes in the pollution ridden Kathmandu. Preparations were underway to construct a cycle lane in Thamel with the aim of attracting as many as tourists, said Ram Thapa, Chief of the Physical Infrastructure Division of the KMC. The facility will be expanded to other places of the Kathmandu Valley as per need, he added. "Cycle lanes are urgent need in the valley to contain increasing pollution created by vehicles." 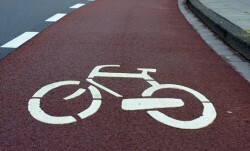 KMC has allocated Rs 10 million for the fiscal year to build cycle lanes in the valley. "We will start the project from Thamel in the beginning," he said. Last year, Thamel was declared no-vehicle zone. There are other problems Thamel is dealing with however. Thamel roads are in dilapidated condition that authority concerned should be serious about to repair. Potholes will become so worse during monsoon affecting passage for the people. "The roads in Thamel become muddy during monsoon. Authority concerned should be concerned about it and get to action for repair," said a business person in Thamel.